In the aftermath of the Doklam standoff with China, India has been trying to consolidate its relationship with Southeast Asian countries through an ‘Act East’ strategy. But what many see as the lynchpin to this strategy, the India-Myanmar-Thailand highway project , has been progressesing sluggishly. It’s not clear whether the 1,360 km highway will be completed even by 2020. In fact, work on the highway’s two major stretches ­— the Tamu-Kyigone-Kalewa stretch of 149.7 km, and the Kalewa-Yagyi stretch of 120.74 km ­— is yet to start. The tendering process for one has been completed: a few months ago, a joint venture of Niraj Cement Structurals Ltd and the Manipur Tribal Development Corporation was awarded a contract for reconstructing 69 bridges on the Tamu-Kyigone-Kalewa section, built during World War II. Six companies had bid for the work, which is being funded by India under grant-in-aid to Myanmar. The consultant to the project is Ircon Infrastructure and Services Limited. In a reply to Governance Now, the ministry of external affairs (MEA), one of the main stakeholders in the project, said the bidding process for the Kalewa-Yagyi sector “is likely to be completed by end November 2017”. The National Highway Authority of India is the consultant for the sector. But reports also say that in September, a joint venture of Punj Lloyd Ltd and Varaha Infra Ltd was awarded the contract for this section. A Punj Lloyd spokesperson said on phone that the company is “waiting for a formal letter of award of contract for the construction of the road on Kalewa-Yagyi section from the NHAI.” The Kalewa-Yagyi sector falls in Myanmar. While this speaks volumes about the lack of coordination among agencies involved in the trilateral project, there’s a palpable lack of enthusiasm for the project among government functionaries. The feasibility study for the Kalewa-Yagyi section began in January 2014. The MEA hired Egis-India, a subsidiary of France-based Egis Group, to carry out a feasibility study. By October 2015, it was completed and submitted to the government. But the tendering process was delayed. A senior government official said, “The whole trilateral project, which was supposed to be over by 2016, is heading for another spell of delay.” He said the involvement of multiple agencies and lack of coordination between them was a reason for the delay. In the India-Myanmar-Thailand Joint Task Force Meeting in New Delhi on September 10-11, 2012, all stakeholders had agreed to complete the trilateral highway project by 2016. The then prime minister Manmohan Singh, during his visit to Thailand on May 30, 2013, had reaffirmed the importance of the trilateral highway project in a joint statement with his then Thai counterpart Yingluck Shinawatra. Five years later, Singh’s successor Narendra Modi reiterated the same during his September 5-7 visit to Myanmar. In a joint statement issued by Modi and Myanmar’s state counsellor Aung San Suu Kyi on September 6, both countries maintained that “work would shortly begin on reconstruction of bridges on the Tamu-Kyigone-Kalewa road and on the Kalewa-Yagyi sector of the trilateral highway”. But in his speech at the 13th ASEAN-India summit in Kuala Lumpur in November 2015, Modi stated that the trilateral highway project is making good progress and should be completed by 2018. These statements point to the fact that, on the ground, progress is tardy. “Our challenge has never been ideas but implementation. Both ‘Look East’ and ‘Act East’ have rightly identified essential needs, both to open up to our Southeast Asian neighbours and boost connectivity with them, and for economic growth in our northeastern states. Unfortunately, getting roads built and rail lines laid is far more difficult than making speeches! Project execution is our besetting weakness and the comparison with China is stark. The constant delays in completing the highway project are not encouraging,” remarked Shashi Tharoor, Lok Sabha MP and chairman of the parliamentary standing committee on external affairs. At the India-Myanmar-Thailand ministerial meeting in April 2002 in Yangon, Myanmar’s former capital, the construction of a highway connecting India’s Moreh (in Manipur) with Thailand’s Mae Sot was conceived. And it happened a year after Jaswant Singh became the first Indian foreign minister to visit Myanmar in 20 years. He visited Myanmar to inaugurate the India-Myanmar Friendship Road on February 13, 2001. Way back in March 1993, JN Dixit, then foreign secretary, had floated the idea of an India-Myanmar friendship road during his visit to Myanmar. Running between Moreh to Kalewa, the friendship road forms the first segment of the trilateral highway. In 2005, the Border Roads Organisation (BRO) was entrusted with the task of building and upgrading the 132 km Moreh to Kalewa stretch. After being completed in 2009, the project was handed over by the BRO to Myanmar. Connecting Kalewa to Mandalay, Myanmar’s second largest city, is the responsibility of the ruling dispensation of that country, and so is the construction of road between Mandalay to Naypyidaw, and onward to Payagyi, Theinzayat and Thaton and other stretches of the trilateral highway within Myanmar. The road from Mandalay to Hpa-An, the capital city of Myanmar’s Kayin state, has already been built, while the road between Karaweik and Myawaddy in Myanmar was opened to the public after officials from Myanmar and Thailand jointly inaugurated it on August 30, 2015. Other stretches of the trilateral highway are yet to be constructed. Protests by local rights group, lack of environment clearance and difficult geographical terrain are cited as reasons behind non-completion of many roads projects in the Southeast Asian country. As such, it is unlikely that the trilateral highway will be completed by 2020, according to even diehard optimists like K Yhome of the New Delhi-based Observer Research Foundation. But he admits that even China, which is praised by some people for executing projects very fast, has lagged behind on some projects. “Myanmar had to suspend the $3.6 billion Myitsone Dam project in 2011 because China was causing inordinate delay in constructing it. Similarly, the Chinese are building airports in Pokhara and Lumbini in Nepal, besides other infrastructure projects, for years. Therefore, it is not easy for China also to execute projects on time. Environmental to social to others, there are several issues which create hurdle in smooth implementation of a project,” says Yhome, who has written a book on Myanmar. A similar comment has been made by Ashish Tandon, managing director of Egis India, the company which carried out a feasibility study for the Kalewa-Yagyi sector. He said that apart from being a difficult terrain, it is full of engineering challenges. “The terrain is mainly hilly in the first 30 km section and highly undulating in last 90 km, where it meanders within a long narrow valley between two adjacent hill ranges. Due to this critical location, rainwater rushing from both the hillsides creates major issues of drainage, erosion and stability. The existing road was earthen along almost half the length and had to be closed to traffic all through the rainy season. Therefore, adequate drainage provisions became critical element to ensure all-weather road connectivity,” he said. Working conditions are also very challenging, he said, as the location is remote, lacks facilities like electricity, water supply, accommodation, mobile connnectivity, internet, banking. Besides, money exchange is a major problem: Indian banks don’t have banking and exchange rate understandings with their Myanmarese counterparts. However, MEA sources say there are no challenges in executing the trilateral highway now as whatever obstacles were there have been addressed. Experts say smooth operationalisation for movement of vehicular traffic is another major headache. In order to facilitate seamless movement of passenger and cargo vehicles between the three countries, India had proposed a trilateral motor vehicle agreement in 2015. But it could not be ratified by Myanmar’s previous government, which raised technical issues. 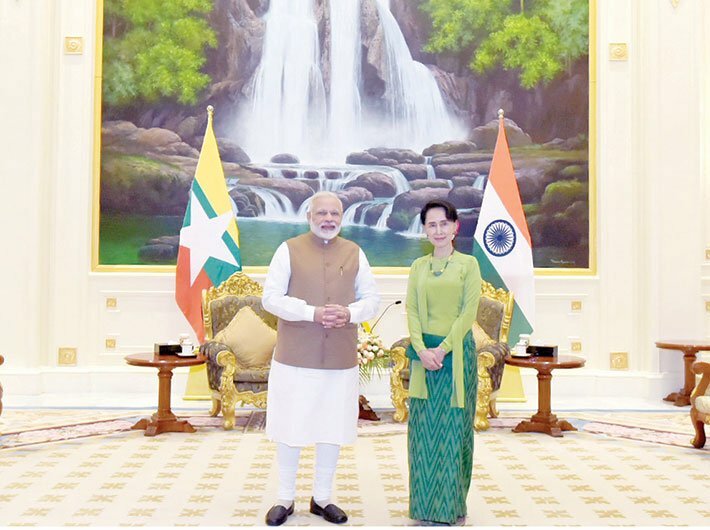 People familiar with the matter say that Naypyidaw wanted to sort out the problem of India following the left-hand traffic system, while Myanmar had switched to right-hand traffic system. The mismatch could cause accidents, Myanmar contended. But however strong the agenda, it has to be backed by strong, uncompromising political will. “If India really intends to broaden and deepen its engagement with BIMSTEC and ASEAN countries, it will have to do away with the gap between promises and their implementation,” says Yhome. Can the Modi government pull it off?